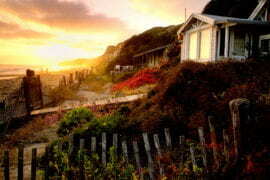 The sun will rise in the east and set in the west today, just as it always does. But 20 incoming freshmen and transfer students who participated this year in the inaugural Summer Institute for Sustainability Leadership are seeing that process – indeed the entire pulse of the planet – in a whole new light. 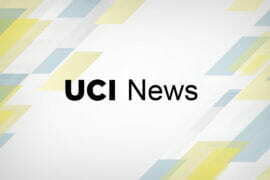 SISL (pronounced “sizzle”) is a first-of-its-type program in the University of California system, a joint endeavor of UC Irvine’s Global Sustainability Resource Center, Student Affairs office and The Green Initiative Fund. 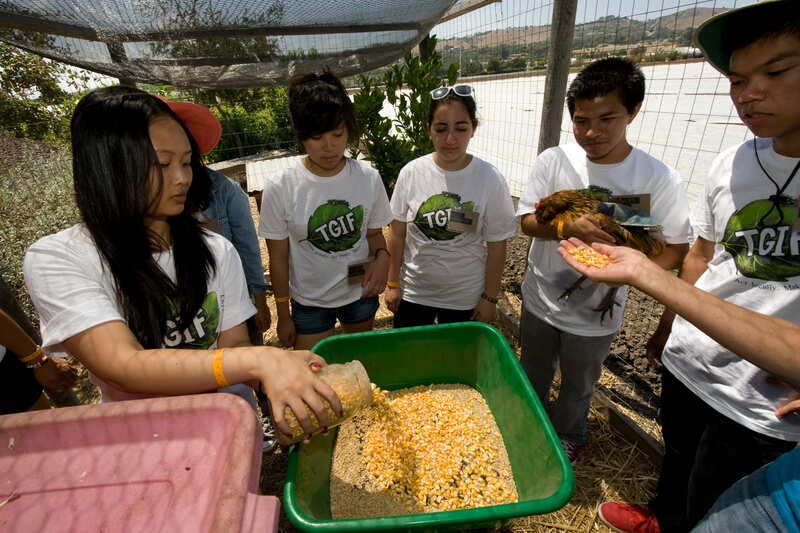 It offers select students a chance to build leadership skills while learning about Earth-friendly practices on campus and around the world, according to Abby Reyes, staff director of UC Irvine’s Academic Sustainability Initiative. 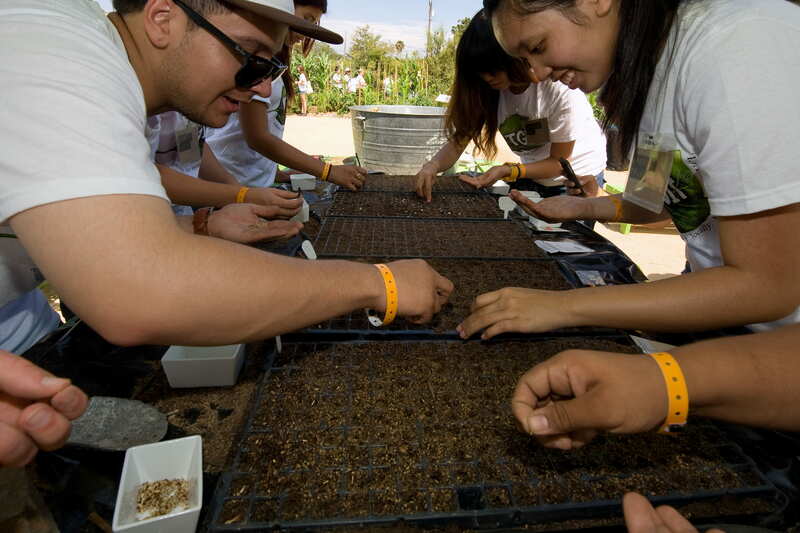 The institute provides workshops on sustainability as well as leadership and action-oriented projects that engage students in fun team-building activities and community service. It culminates in a group project presentation and networking brunch with faculty, administrators and leaders in global sustainability. 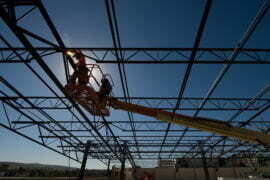 The curriculum highlights the role of the students’ generation in creating a life-sustaining society. 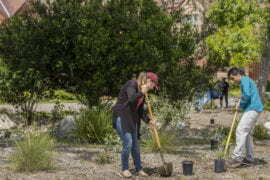 The hope is that participants will tackle projects aimed at slowing the Earth’s decline during their time on campus. Aspirations this summer ranged from enlisting big business and politicians in sustainability efforts to convincing individuals to consume less stuff. The 2013 leadership training began with a test that gauged the emerging activists’ project execution, influencing, relationship building and strategic thinking skills. 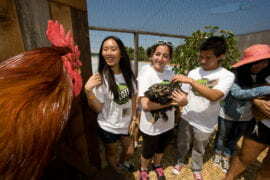 The students’ schedule included a visit to San Juan Capistrano’s Ecology Center, where they learned about sustainable farming techniques such as mulching, composting, and harvesting and grinding homemade chicken feed. They also pumped their own water, a lesson that brought home the difficulty of supplying water for drinking and irrigation. “Only 1 percent of the water on the planet is usable, because 97 percent is saltwater and 2 percent is frozen glacier ice,” noted Brenda Tran, a freshman in pharmaceutical sciences. During a panel discussion on global leadership, the students shared their thoughts on the book The Story of Stuff: The Impact of Overconsumption on the Planet, Our Communities and Our Health – and How We Can Make It Better. 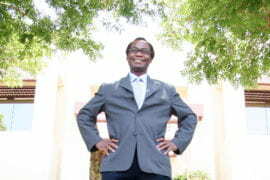 At the concluding lunch, Wendell Brase, vice chancellor of administrative & business services, told the students that they’re on the right track. Besides Lewis, the SISL mentors this summer were Al Anoud Baddour, a sophomore in biological sciences; Audra Bylund, a senior in social ecology; Katherine Chin, a senior in Earth system science; Vivi Sanchez, a junior in civil engineering; and Kenny Teeter, a senior in civil engineering. 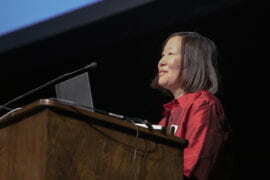 Jaimie Wan, a senior in urban studies, served as project assistant. 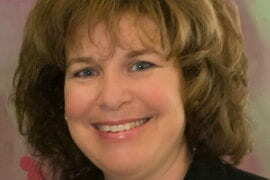 Marisa Arpels coordinated the institute on behalf of the Global Sustainability Resource Center. 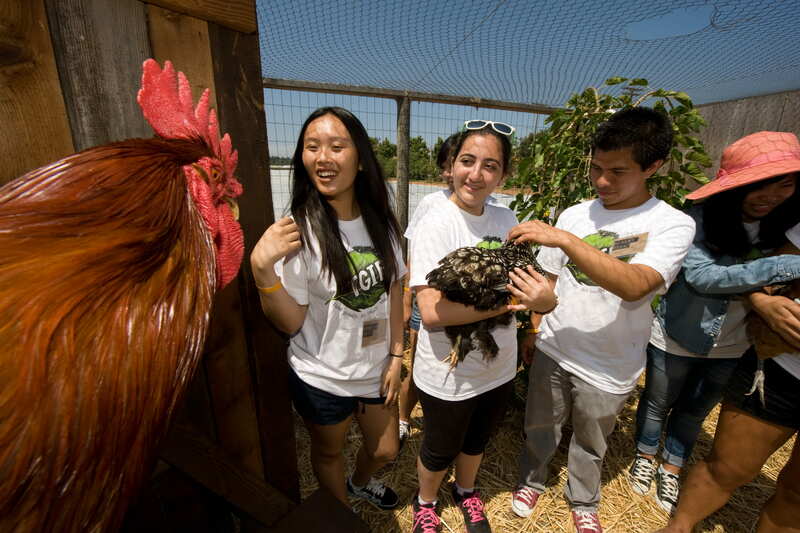 UCI newcomers in the Summer Institute for Sustainability Leadership meet Red the Rooster and other fowl during a trip to The Ecology Center in San Juan Capistrano. 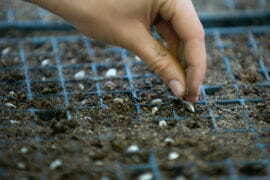 Students plant seeds before the flats are transferred to the greenhouse. 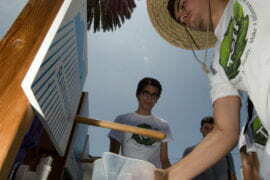 The Summer Institute for Sustainability Leadership will be offered annually. 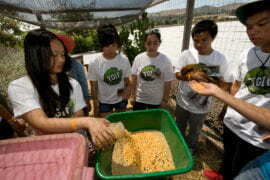 SISL participants mix chicken feed at The Ecology Center. They learned about sustainability and built leadership skills during the three-day program. 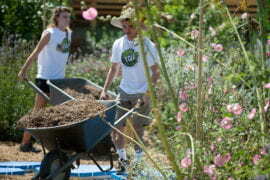 Oswaldo Martinez transports mulch in a wheelbarrow. 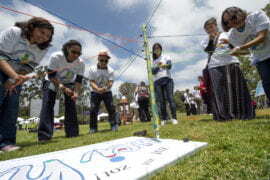 It’s hoped that SISL students will launch sustainability projects during their time at UC Irvine. 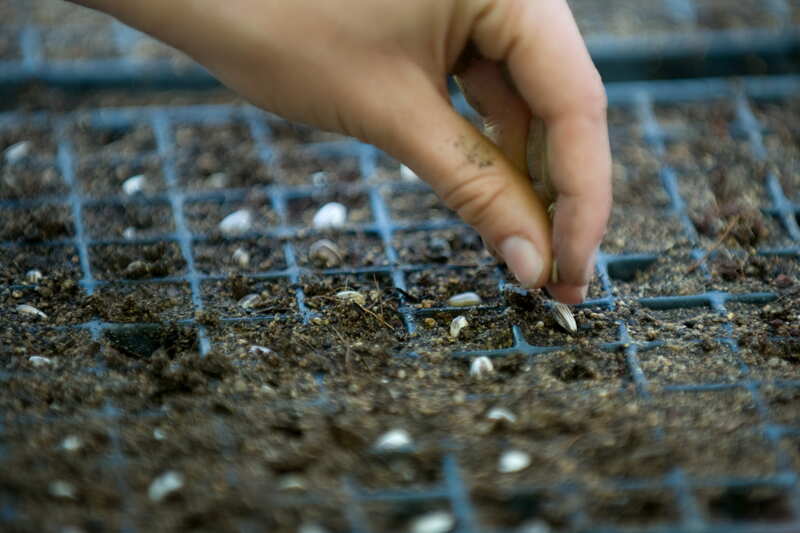 SISL students plant seeds at The Ecology Center before they’re transported to the greenhouse. 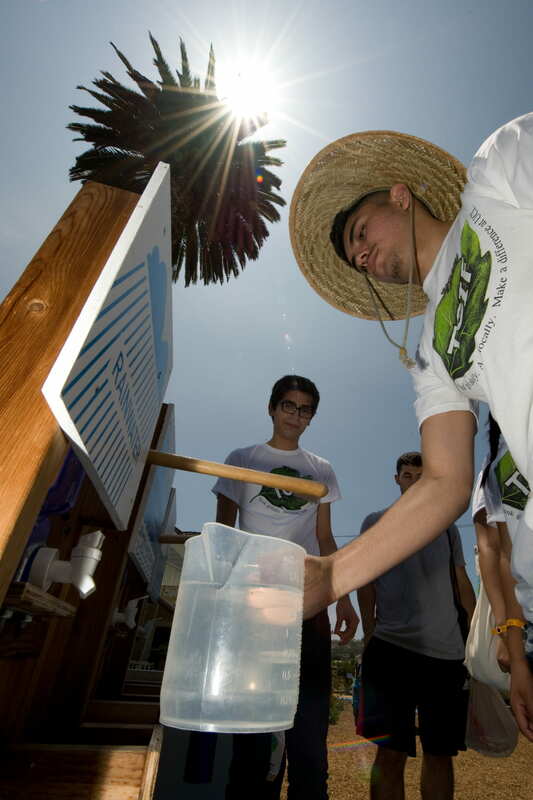 SISL participant Oswaldo Martinez, a freshman in environmental science, fills up a pitcher at an interactive display at San Juan Capistrano’s Ecology Center. 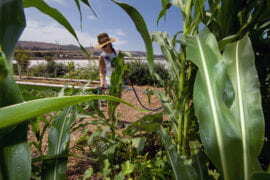 Melissa Lewis, a social ecology senior and SISL mentor, waters vegetables. This summer’s inaugural institute had 20 students and six mentors.